At Starbucks we’re proud to call a wide variety of brands part of our family. And Starbucks partners have the unique opportunity to work with all of these brands. Explore our brands below and discover opportunities you might be involved in down the road. Every day, we go to work hoping to do two things: share great coffee with our friends and help make the world a little better. It was true when the first Starbucks opened in 1971, and it’s just as true today. With more than 18,000 stores in 62 countries, we strive to bring both our heritage and an exceptional experience to life. 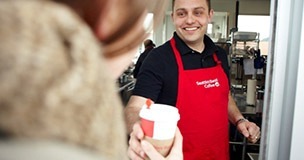 We’re looking for amazingly talented partners to be baristas, shift supervisors and managers. To apply, select the role that you’re interested in from either of the drop-down menus. 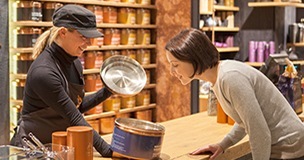 Since 1997, Teavana® has offered customers super-premium, loose-leaf teas. With unique blends that mix innovation and inspiration, these teas are a reflection of our pursuit to source the highest-quality ingredients. Tea, teaware and tea gifts are currently in Starbucks stores and retailers around the world. 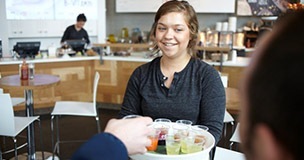 Right now, we have opportunities in our Corporate Offices for Starbucks roles that are aligned to Teavana. To apply, select the role that you're interested in from the Corporate drop-down menu above. Since 1992, Evolution Fresh™ has been offering delicious nourishment. Our Evolution Fresh™ retail stores offer juices and foods that are alive with fresh‐picked flavor and bursting with bright color and vibrant, pure taste. We also sell Evolution Fresh™ juices at select Starbucks stores and retailers around the U.S.
Seattle’s Best Coffee started roasting coffee on the Seattle waterfront in 1970 and won the title “Seattle’s Best Coffee” in 1991. This history, plus the support and backing of Starbucks, means customers can always count on a great cup of coffee every day, no matter where they are.